"A thriller that excels in creating tangible realism and a tone reminiscent of a memoir, which gives the novel authenticity; highly contemporary and relevant; if you enjoyed Mr. Olivares’s “Death on Sun River,” you’ll surely enjoy "China's 8th Dragon!" The Columbia Review. 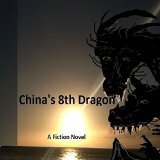 “China’s 8th Dragon” is the second novel from author Jose Reyna Olivares (“Death on Sun River,” 2014). It features a young man from Michigan, Rico Tombunga, who enlisted in the Marines and served in South Vietnam, placing him on a path of a lifelong service to his country that requires violence, deceit, and occasional evildoing. The author’s real-life experiences in uniform and as a U.S. diplomat in Asia translates here into a thriller that excels in creating tangible realism and a tone reminiscent of a memoir, which gives the novel authenticity.